A Mt. Emily Lumber Company Shay, possibly the #1. Photo from the collection of Marc Reusser. In 1890 the Grande Ronde Lumber Company built a sawmill on the Union Pacific mainline at Perry, OR. The company built a logging railroad up the Grande Ronde river to supply logs to the mill. The company used a series of geared locomotives, mostly Heislers, to power the railroad. However, by the mid-1920's the company found further expansion blocked by the holdings of the Mount Emily Lumber Company. In 1925 the Grande Ronde company sold its railroad and remaining timber up the Grande Ronde river to the Mount Emily Lumber Company. By 1926 the company had closed its Perry mill and moved to a new location, Pondosa, OR. The story of the Grande Ronde operation continues on the Big Creek & Telocaset page of this website. About 1911 the A.H. Strange Lumber Company sent representatives to Union County, OR, to look over timber lands. In August the company formed the Mt. Emily Timber Company to acquire and hold timberlands, and within two years the company held over 100,000 acres of prime timber. The company finally prepared to move west in 1924, and in that year they formed the Mount Emily Lumber Company to take over the Oregon properties. The new Mount Emily Lumber Company constructed a sawmill in La Grande, OR that had a daily cut of 150,000 board feet. The company started construction on a logging railroad from the Union Pacific mainline eight miles west of La Grande. The railroad's initial equipment roster consisted of two Alco-built 2-8-2T locomotives, two Clyde slideback loaders, one moving car, five tank cars, one speeder, and 14 or more camp cars. Union Pacific shuttled loaded and empty log cars between La Grande and the logging railroad. In 1925 Mount Emily purchased the Grande Ronde Lumber Company logging railroad. The company quickly found the Alco rod engines unsuitable and replaced them with geared locomotives. Mount Emily expanded the old Grande Ronde logging railroad further west until around 1930, when the company shifted from rail logging to truck logging. The railroad mainline remained in place and in use, but the company built truck roads instead of rail spurs out to the harvest sites. 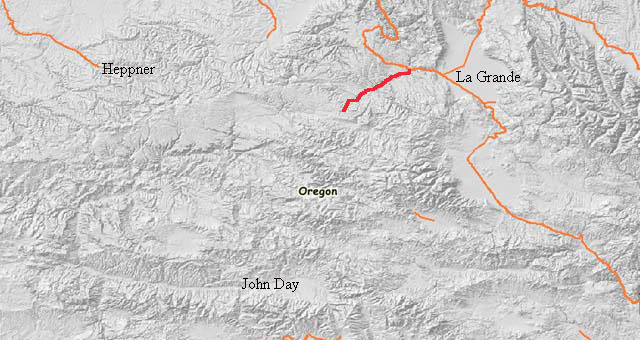 The Grande Ronde river drainage remained a primary source of logs for the company, but it lost some importance as the company purchased other timberlands, mainly in the Enterprise/Joseph area. In 1944 the lumber company built a six mile extension to the railroad, which lifted it out of the Grande Ronde river watershed and into the John Day River watershed. The railroad then reached the form it would hold for the remainder of its existence. The two geared locomotives left on the line would take daily trains down to the UP interchange, where the big road would then forward the loaded cars to the mill in La Grande. In 1955 the Valsetz Lumber Company acquired the Mount Emily Lumber Company. The new ownership promptly closed the logging railroad in favor of truck hauls, and the last log train came out of the woods on 20 June 1955. The railroad was scrapped a shortly afterwards. The Valsetz company deeded the primary camp on the railroad to the Blue Mountain Conservative Baptist Association, who turned the site into a youth camp named Camp Elkanah using the former camp cars. In 1960 the Valsetz Company sold out to Boise-Cascade. Some Portland area railfans became aware that one of the geared locomotives used on the railroad at the end was a product of the Willamette Iron & Machine Works of Portland. They opened talks with the Valsetz company about preserving the machine. The Oregon Museum of Science and Industry opened discussions with Valsetz and soon had an agreement to preserve the locomotive. However, Valsetz forgot to tell their scrapping contractor about the preservation deal before they cut the locomotive up. Valsetz then gave the other remaining locomotive, a 3-truck Shay, to the organization. The Shay bumped around Portland for 15 years before being leased to the Cass Scenic Railroad in West Virginia. In 1994 the locomotive came back to Oregon. The City of Prineville Railway won the right to host the locomotive, and it has operated there ever since. The approximate route of the Mt. Emily Lumber Company logging railroad is shown in red. 1st #1- Alco 2-8-2T, c/n 66276, blt 3/1925. Cylinders 18x24, Drivers 44", Weight 84 tons, Tractive Effort 28,500 lbs. Purchased new. To Long Bell Lumber Company #805, Longview, OR; transferred to Vaughn, OR by 1952. 2nd #1- Lima 3-truck Shay, c/n 3233, built 9/1923. Cylinders 13x15, Drivers 36", Weight 90 tons, Tractive Effort 35,100 lbs. Built as Independence Logging Company #1, Independence, WA; to Mt. Emily Lumber 1925. Donated to Oregon Museum of Science and Industry 1955; to Oregon Historical Society 1960. Leased to and operated by Cass Scenic Railway, Cass, West Virginia 1970-1994, then returned to Oregon. Currently in occassional excursion service on the City of Prineville Railway. #2- Alco 2-8-2T, c/n 6627?, blt 3/1925. Cylinders 18x24, Drivers 44", Weight 84 tons, Tractive Effort 28,500 lbs. Purchased new. To Long Bell Lumber Company #804, Longview, OR; to Harbor Plywood Co. #804, National, WA; to Harbor Plywood #804, Amboy, WA. Scrapped by 1959. #4- Willamette 3-truck, c/n 15, blt 6/1924. Cylinders 12x15, Drivers 36", Weight 87 tons, Tractive Effort 31,968 lbs. Built as Long Bell Lumber Co. #700, Longview, WA; to Mt. Emily #4 1927. Donated to Oregon Museum of Science & Industry 1955, but accidently scrapped before it could be delivered. #5- Lima 2 truck Shay, c/n 2614, Blt 1/1913. Cylinders 11x12, Drivers 32", Weight 50 tons, Tractive Effort 22,580 lbs. Built as Deep River Loggin Company 2nd #5, Deep River, WA; to Zimmerman-Wells-Brown Corp; to Mt. Emily Lumber #5 1925. To Willamette Iron & Steel #5 9/1942. Scrapped after World War 2. "Mount Emily Lumber Company" by John A. Taubeneck, Winter 2000 Tall Timber Short Lines: pgs 12-21.